The dream of building games simultaneously for iOS and Android always seemed like a goal just outside of our reach. Unfortunately, writing code for Android requires learning an entirely different set of tools than for iOS, and with a core team of just two, we wanted to play to our strengths. All our apps so far have been built in native iOS code. Therefore, the decision to port Sorcery! to Android was a question of who? and how? One of the things we did when adapting Sorcery! was to stuff it so full of hidden surprises and Easter eggs that wandering off the beaten track and trying new things would always be worth your time. And with the series making its Android debut next Wednesday, we thought it'd be a good time to set a few challenges. Survived the fields of the Black Lotus? Met a man with an identical twin? Been eaten to death by bats? Collected more than seventy Gold Pieces? Solved the riddle of Daddu-Ley? Been cursed by a spirit? Set off, and survived, all three traps in the Manticore's maze in a single run? Completed the game without a single fight (except for the tutorial sparring match)? Met the founder of the City of Kharé? Bought the Legendary Sword? Or better still, bought it twice? Collected more than a hundred and fifty Gold Pieces? Met the Goblin King - and incite a Goblin revolt against him? Rigged the fight in Dwarftown? Stolen gems and jewels from the God Courga? ...and defeat all Seven Serpents while you're at it! To celebrate the new year - and to take a few weeks off from actual development for once - we've spruced things up around here, with a brand-new layout for our website. From the front-page you'll now be able to see all the projects we've worked on over the last two years, from Sorcery! through Poems By Heart via First Draft of the Revolution and Frankenstein. Browse around and let us know what you think. Also - we're looking to expand. Like what we do? Check out our join us page. 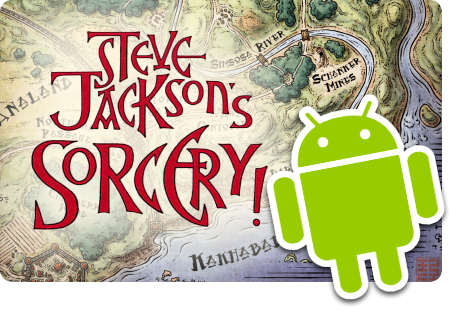 Oh, and if you're waiting on the Android release of Sorcery! - stay tuned, it's coming, promise. 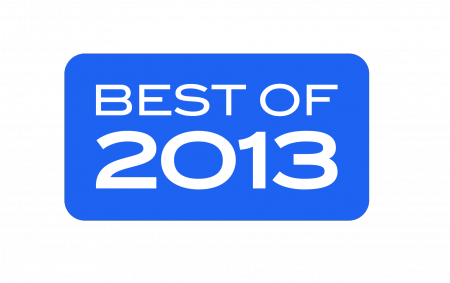 If you don't recognise it, that's an Apple "Best of 2013" emblem, awarded to a handful of apps deemed the very best-of-the-best of the year's output to the App Store. This particular one comes attached to Poems By Heart, the app for memorising and sharing poems that we designed and developed for Penguin Classics USA. Poems was our first release of the year and came out last January, and was a headline app in the Education section of the Store for several months. It's now just been updated with additional content as well. Sorcery! 2 has now been out just over a week, and several thousand people have entered the city: some of them have even left again. It's been an exciting week for us, trawling the internet on the look-out for reviews, which ranged from enthusiastic 5/5's like this one on Slide To Play to this 8/10 Silver Award-winning review on Pocket Gamer which reads like the reviewer had something of a harder time of it. The overall result is good - our Metacritic score is 88, three points up from last time around..! Today is inkle's second birthday - and in another way, it's also Sorcery! 's, because today Steve Jackson's Sorcery! 2 has hit the App Store, ready to take you on an adventure into Kharé, the Cityport of Thieves. The first few reviews are already in: Capsule Computers gives it 9.5/10, while at Pocket Tactics they went the whole way to 5/5, and at Gamezebo they say its "so artistic you'll want to hang it on your wall", with a 5/5 review.